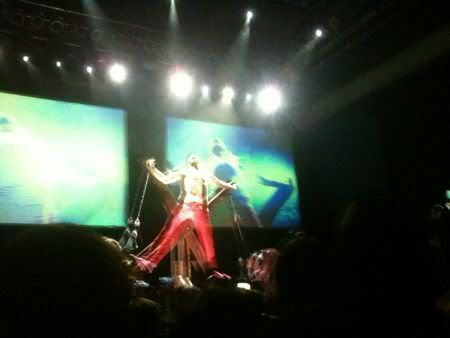 I really, really like the band Of Montreal. Their music is like a ray of psychedelic sunshine, and Kevin Barnes is the man, one of the best lyricists of our generation, I do believe. Plus their shows are just so much fun. I want to throw a party with only Of Montreal songs on the soundtrack. I want to quit my job and follow the tour around the country, like a Deadhead but with more body glitter. I want to show them off, I want to write them books, I want to corrupt their dreams, I want to crash their car. Just song lyrics. Anyhow, the only thing is that at the concert last Thursday, I was surrounded by a sea of middle schoolers. Pro: they were short so I could see over them. Con: Once again, I can't help but wonder [said in a Carrie Bradshaw voice], do my tastes need to mature? Of Montreal covered "I Want You Back" at 9:30 Club just like they did earlier in the week in NYC, but this time no Solange and no Susan Sarandon. Here's a little video I took from the DC show, it's kinda shaky because I was ready to start jumping up and down. February 3, 2010 by Adele Chapin.